A Hammer Toe is essentially a plantarflexion deformity of the proximal interphalangeal joint with the distal interphalangeal joint remaining normal or possibly dorsiflexed. 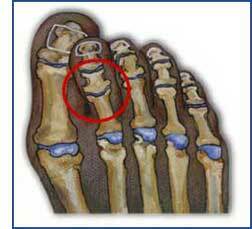 This can occur in any of the three middle toes, with the second digit being the most commonly affected. Toes are bent upward (extension) from the joints at the ball of the foot. Toes are bent downward (flexion) at the middle joints toward the sole of your shoe. Sometimes toes are bent downward at the top joints, curling under the foot. Corns may develop over the top of the toe or under the ball of the foot due to pressure and friction. If you have symptoms of a claw toe, see your foot specialist for evaluation. You may need certain tests to rule out neurological disorders that can weaken your foot muscles, creating imbalances that bend your toes. 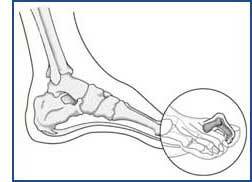 Trauma and inflammation can also cause a claw toe deformity. Wear shoes with soft, roomy toe boxes and avoid tight fitting shoes and high-heels. A special pad can redistribute your weight and relieve pressure from the ball of your foot. Try special “extra depth” shoes that have an extra roomy toe box. Ask a shoe repair shop to stretch a small pocket in the toe box of your shoe to accommodate the deformity.